In May of this year, 2017, I was invited by one of our mortgage fund investors to attend the 2017 Berkshire Hathaway [BH] annual shareholders meeting in Omaha, Nebraska. The only previously similar investment conference I had attended was in New York City in 2012. This was a Wall Street Journal Investment Fund conference. I listened to some of the smartest [cognitively] people talk on the subject of investments. The presenters all had advanced degrees from ivy league colleges and were so articulate, intelligent and confident when they spoke from the podium. After one day, I had a splitting headache and wondered what I, a private mortgage investor from Santa Ana, California was doing in this NYC conference with all these brilliant, and I mean brilliant, financial engineers. Notwithstanding, off I went to Omaha. On Saturday morning, May 6th, Mr. Buffett and his partner, Mr. Munger, came out onto the podium and took their seats before a packed audience of over 40,000 attendees at the Century Link Center in Omaha, Nebraska. I sat back in my seat with the biggest smile on my face. If I could have laughed at that moment, I would have laughed for a long time. Wow!!!!! I see. I get it!!!! And then I thought of the contrast between NYC and Omaha. In New York, not once did I hear a word of caring from the presenters for their investors. It was all so intellectually clinical. Not once in NYC did I hear a word of humanism. It was all so robot-like. In NYC, there were more discussions of what I have grown to call ‘Venus flytrap investments’; investments so complicated that only a doctorate in higher mathematics could follow it. On the other hand, in Omaha, Mr. Buffett encouraged his audience to check out the jewelry store BH owned in Omaha, plus the furniture store as well. These BH companies were giving special discounts on their merchandise to shareholders! That Saturday in Omaha, I witnessed a man who has excelled not only in the investment world but also maybe even more importantly in the everyday world of being just a good human being, warts and all. Thank you, thank you, thank you, Adreana for making possible this once in a lifetime experience in Omaha. To our Brownstone investors, hope you’re enjoying your rates of return. Thank you for allowing us to work for you. We will keep on trying to do our best for you, each and every day. Mortgage investing is so vast and diverse that most investors do not look at it as a separate form of investment. This is because mortgage investing crosses over all three main classes of investment: stocks, bonds and real estate. 2) Signs a mortgage lien that is recorded against the real property to act as security if the loan is not repaid. Most investors, when they do think of mortgage investing, think of it as a local investment. It is, but it also can be national in scope. Mortgage investing can be a safe and secure investment for the investor looking for monthly income. A mortgage investment combines a promise to pay (a bond) with a secured lien (against a parcel of real property). If the borrower does not pay, the mortgage investor has the contractual right to foreclose on the real property to recover his invested money. Mortgages have been around for centuries, and is one of the most widely held investments by banks and investment houses. However, for the individual mortgage investor, investments in mortgages can pose a challenge. I have personally witnessed seven costly mistakes repeated over and over again. 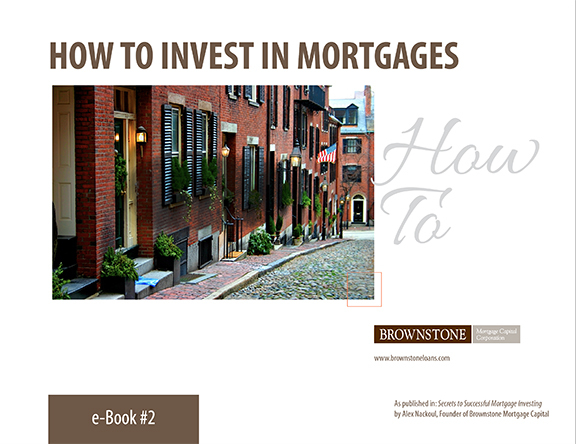 Contact us to receive your full version of this first edition eBook from Brownstone. This website is for general information purposes. Please request additional legal documentation for further interest in investing with Brownstone. Each potential investor is encouraged to consult with his, her, or its own independent legal counsel, tax advisor or other professionals with respect to the legal and tax aspects of this investment. California Department of Corporations #603-8791 and California Department of Corporations Permit #309-4741. California Department of Real Estate #00874488.